As you recognize there are so many android apps in the market, but we girls are fond of women traditional dresses and women sarees is one of the best and favorite dress. Now because ladies look beautiful in designer sarees but I would like to highlight one thing that nowadays technology is too smart it gives us the way through which we try every stylish sarees without wearing it and it can only happen by the women saree photo maker app. 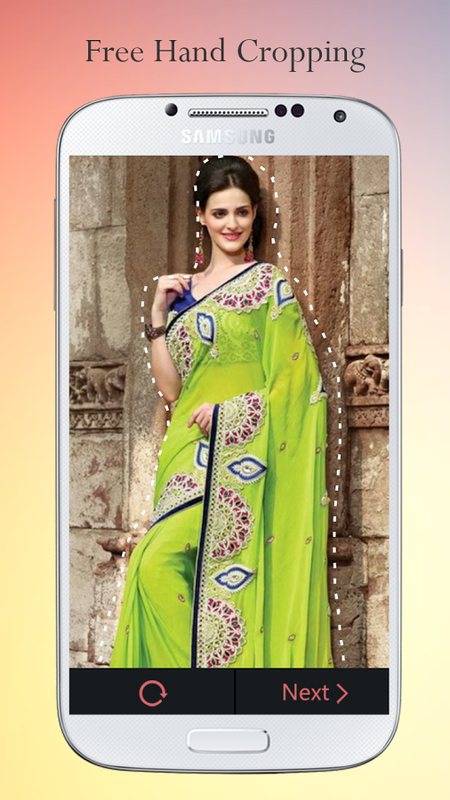 Through this app, you may try the sarees collection on yourself without make them wear physically. We have categories of designs of saree for ladies, which women like a lot after seeing the image. Apps for women saree fashion are one type of the medium of entertainment also. Women may enjoy different styles of sarees collections like party wear sarees, wedding sarees, bridal sarees, Indian sarees and fancy sarees. ♡ We design this application for women with different sarees designs. ♡ Select beautiful and fashionable wedding sarees from the available sarees. ♡ Fit selected photo in selected saree photo by drag, rotate, zoom in or zoom out. We provide user-friendly options to set your photo in beautiful sarees. ♡ Edit your photo with stylish sarees and enjoy your new look in different styles without buy saree. ♡ Take camera photo and fit your face set to the bridal saree suits. Women saree photo maker app covers all popular traditional dresses of various regions in India. Even though the Wide array of fashionable clothes is available in the market, Traditional wear has its unique identity. So don’t waste your time and download this amazing Beautiful application and try our designer collections !! !